Oak trees are an important part of the Texas landscape. They provide shade and beauty and can be found in most regions of the state. 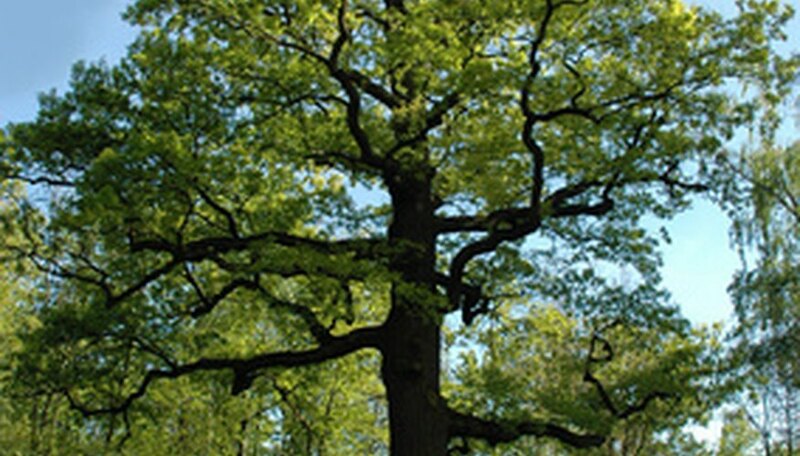 Most oaks are long-lived, but there are several diseases that can affect these trees. In many areas, the mortality of oak trees has become a major problem. The most common oak disease found in Texas trees is called oak wilt. Oak wilt is one of the most destructive tree diseases, having killed more than 1 million trees in central Texas. It is a fungal vascular disease that clogs the water-conducting system of a tree and shuts it down, causing the infected tree to wilt and die. Red oaks are the most susceptible to oak wilt, with white oaks being the most resistant. Oak wilt spreads easily from tree to tree; it can be transmitted through the trees' underground root systems or by an insect called a sap beetle. Hypoxylon canker is a fungus that affects oak trees in East Texas. The fungus infects the sapwood of trees that are damaged or stressed, but will not affect healthy trees. It occurs commonly during times of drought when trees are particularly stressed from lack of water and nutrients. Unlike oak wilt, Hypoxylon canker does not spread from tree to tree. There is no cure for this disease, but maintaining healthy, vigorous trees can help prevent it. Anthracnose is a fungal disease that affects the leaves of oaks in Texas. It is recognized by the small irregular spots that form along the veins of the leaves. If the infection is bad enough, it can cause the leaves to fall off the tree. Anthracnose doesn't usually kill the tree, but trees that are affected annually can become weakened. To control anthracnose, rake up dead leaves from infected trees and destroy them. You can also use a protective fungicide to help control the damage. Oak leaf blister is another fungus affecting the leaves of oak trees, especially post oak, water oak, red oak and live oak. It causes a large bulge on the top of the leaves that starts out light green and later turns brown. It rarely kills the trees or causes defoliation, except when the infection is severe. Very susceptible trees can be treated with a fungicide that contains copper, but chemical control is not usually recommended. Oak decline is a diseases that is associated with fungus and stress. In Texas it mostly affects live oak trees that are stressed due to drought or urban stresses. Oak decline happens slowly. The thinning of the canopy, smaller leaf size, and dying twigs and branches are the first signs of oak decline. Later, only the main branches of the tree are still alive. Oak decline can be prevented by keeping the trees healthy with deep watering, fertilizer application and limb pruning. You can also treat trees with a fungicide called Arbotect to help reduce the symptoms of the disease. Tracey Bleakley has been writing for the last year. She has had numerous education articles published on both eHow.com and Brighthub.com. She has 10 years experience as an elementary school teacher. Bleakley received her Bachelor of Science in education with a specialization in reading from the University of Texas at Austin.